All of this seems momentous—and in many ways it is—but I also have my eyes on the proverbial “bigger picture.” Whatever happens in this one site of resistance on Burnaby Mountain, Coast Salish Territories, the struggle against fossil fuels, and thus against climate change—the struggle for renewable, green energy alternatives—is only growing. Events like those unfolding on a mountainside in Burnaby galvanize resistance. The charges against activists are widely seen as excessive and bullying, a classic case of a Strategic Lawsuit Against Public Participation, intended to subvert democratic process and our freedoms of speech and assembly. A wave of outrage has arisen against Kinder Morgan, sweeping up critical energy insiders and economists, but more importantly, this wave has arisen against the power of corporations to tilt the systems of governance and the law in their favour, against an industry bent on profit over public interest, and against a system seemingly satisfied to burn the future for a few more dollars and diversions today. What I’m learning, from this experience, is that we are rising, we are growing, and we are building our capacity, at every step, to resist the status quo, and demand another world. Everywhere this growing movement is led and inspired by frontline indigenous land defenders. They are the Secwepmec Women Warriors and Klabona Keepers, standing resolutely against Imperial Metals, demanding justice for the Mount Polley tailings pond disaster—and protection against any repetition of such a disaster. They are the Wet’suwet’en people of the Unist’ot’en Camp, dug in north of Houston BC, in the path of the Enbridge Northern Gateway and Pacific Trails pipelines. They are here on unceded Coast Salish Territory too, refusing Kinder Morgan’s Trans Mountain expansion and the exponential rise of oil tanker traffic in these delicate coastal waters. This is a dream of the common good—a dream of a world of shared responsibilities and shared benefits. We know that this world requires not only an end to our dependence on fossil fuels, but a change in our social and economic outlook—a change from competitive models of growth to practices of commoning and limited growth. We struggle for this world on many fronts. Social change functions by being diverse and multiple. People vote for change, they organize under the umbrella of NGOs to advocate and campaign. They organize as community associations and as grassroots activists willing to do direct action and even civil disobedience. They march and rally. The blockade and occupy. All these various practices—and more—contributed to what we have thought of as our democracy: we simply would not have universal suffrage, would not have work place protections and benefits—there would not have been a civil rights movement or a women’s liberation movement—without all of these democratic practices being engaged. Today, we will stop pipelines, close the tar sands, and develop a new, renewable and sustainable energy system by all these means. We will do so not by denying or decrying our differences, but by respecting them and finding a new capacity for solidarity. I choose to align my own efforts with grassroots climate justice movements and indigenous struggles for decolonization. As a privileged settler, I feel this is the only just thing I can do. And I hope that whatever abilities I have as a communicator can benefit those struggles I am aligned with. Personally, this has been a difficult time. A $5.6 million lawsuit was not one risk that I, or anyone else I have organized with, could have foreseen. Strangest of all has been having my words read in court (as evidence, it would seem, that I just don’t like pipelines). When corporate power—through its lawyers—uses a writer’s words against that writer—when those words become flesh torn between the teeth of capital and the state—the writer is left numb and dumbfounded. This is the intention of course: condemn to silence. Remove the inconvenience. The experience has certainly caused me to stumble. But I am trying to find my feet—and my words—again. 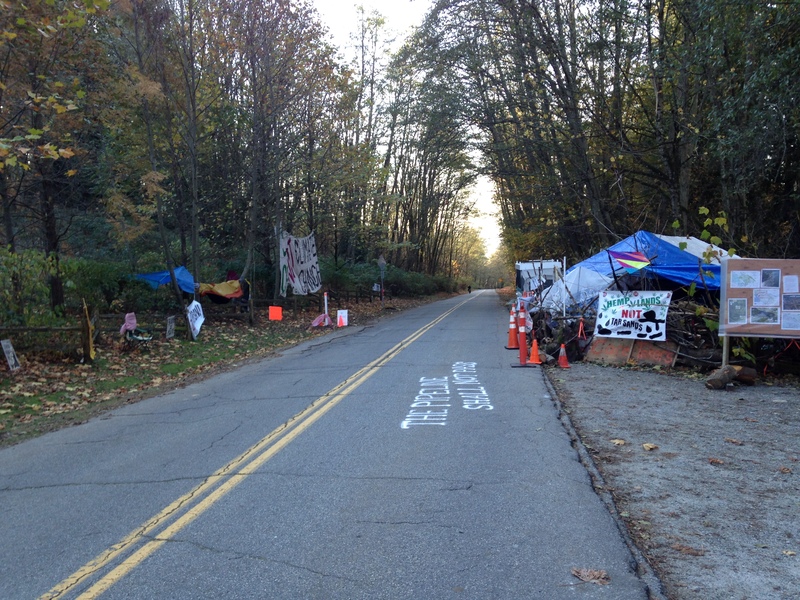 This entry was posted in Uncategorized and tagged climate justice, No pipelines on November 13, 2014 by Stephen. 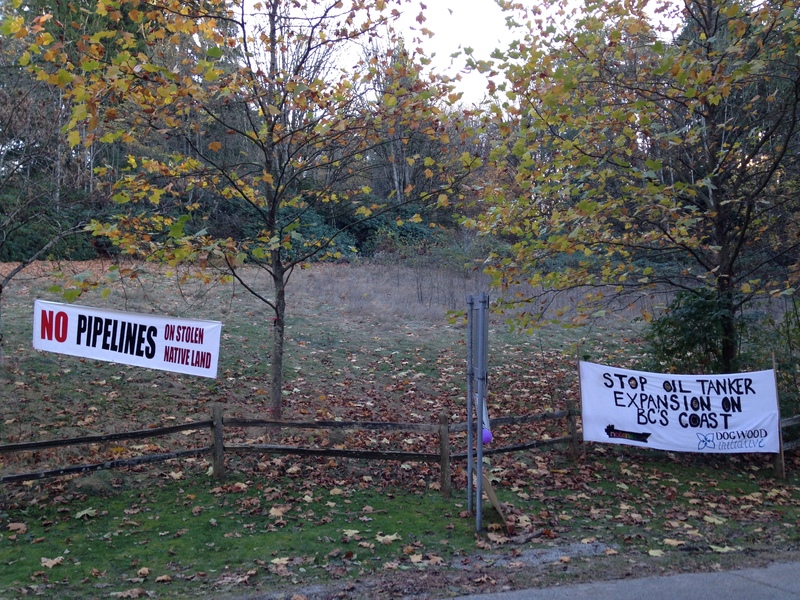 I cannot even imagine how stresfsul this must be for you and the others standing up to Kinder Morgan. You have many supporters out there who will stand with you.